This publication is a great tool for searching your family history or building your family tree. 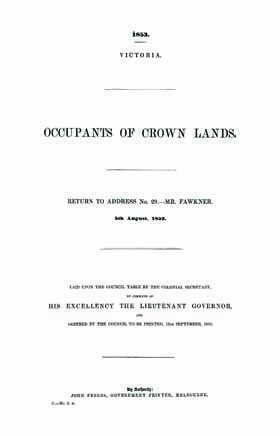 It lists the occupants of crown land licenses for the year 1852, and was presented to Parliament in 1853. It is arranged by district, including: Gipps' Land, Murray, Portland Bay, Western Port and Wimmera. Although this is not a large book, there a literally thousands of names listed, making it a very important genealogy source. Another great genealogy tool, listing approximately 3500 licenses for the years 1851, 1852, 1854 and 1855. It was presented to Parliament in 1856. It is arranged by district and includes summaries for each district by year.